What is commercial plastic disposal? Plastic waste disposal is a global issue that needs to be addressed by everyone, including small businesses. Each year, about 300 million tonnes of plastic waste is produced worldwide, according to data published by the UN. But how – and where – should you begin? Which types of plastic can and can’t be recycled? And what are some of the potential benefits of effective plastic disposal? We’ll provide the key information you need to know in order to understand your business’ plastic disposal requirements. Plastic recycling: What do you need to know? What type of businesses might need commercial plastic recycling? What is the plastic disposal process? What are the benefits of commercial plastic recycling? Skip to the section you want to learn about the most, or read the whole article to gain a more detailed understanding. Otherwise, to compare quotes for commercial waste management right away, just fill in the form at the top of the page. 1. Plastic recycling: What do you need to know? Plastic is a lightweight material, so it’s usually collected in high amounts. The polymer type determines the type of plastic, and thus whether it can be recycled or not. A polymer is a series of connected molecules. Some examples of common polymers are HDPE, PET and PVC. These are also the types you’re likely to see on the bottom of plastic bottles, for instance. Other codes exist, such as PP and PS, although they may be less familiar. The codes for labelling plastics were created by the Plastics Industry Association, the organisation that supports the whole of the supply chain for plastics. It’s not mandatory that plastics are labelled or marked. For some plastic types, it’s possible to follow the closed-loop recycling cycle, which is when the materials (so in this case, the plastics) have been recycled and can be returned to the market to be used again. WEEE stands for Waste Electrical and Electronic Equipment. It refers to any items of waste that have a battery or a plug. 2. What type of businesses might need commercial plastic recycling? If your business creates plastic waste, then you may be able to recycle it. Plastic waste comes from industrial production processes, as well as from utilities and from making other materials. It’s important for all businesses to have a plastic recycling policy – even if it’s just to ensure that you recycle empty drinks bottles. While plastic is a material commonly found in many commercial operations – especially retail and hospitality businesses – there are other examples. For instance, scrap plastic waste may come from glazing companies and warehouses. Similarly, if you’re a florist or run a landscaping business, flowerpots and other trade materials are often made from plastic. Flowerpots can be difficult to recycle, so consider alternatives instead (see below for more information). Covers, wrapping and bags from farm equipment are also examples of commercial plastic waste that could be recycled. If you run a home-based business, remember that the waste produced from your business activity must be treated as commercial waste. 3. What is the plastic disposal process? Plastic waste can be collected as scrap (i.e. in its original state), or it can go through the compacting process. Plastic is usually collected separately in recycling, although some collection companies may offer mixed recycling collections. Some waste collectors may be able to take all types of plastic for disposal or recycling, while others may specialise in certain types. 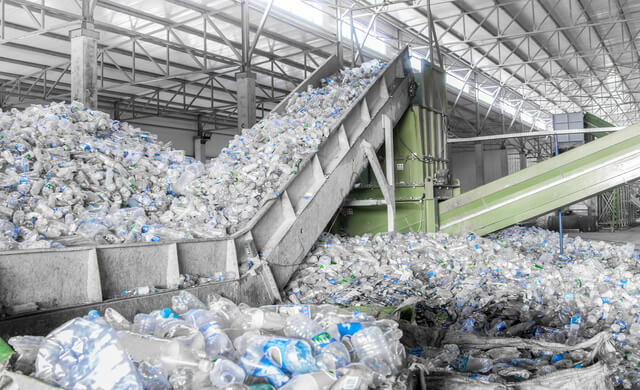 Waste management companies can assess your business’ needs, such as the amount of plastic you use and the ways in which it should be disposed of, and provide a service accordingly. Assess the waste – how much of it can be recycled, and how much will have to go to landfill? Process – can it be easily traced? Material – can it be repurposed? Regulations – does the company meet British Standards (BSI) or international measures, like ISO? Area covered – do you need a local provider, or one that can travel further distances? After collection, the plastic can be taken to treatment or waste disposal sites in the UK, or it may be exported. Plastic isn’t biodegradable – if it’s sent to landfill, it won’t break down. The fact that plastic can be made from different polymers – as well as dyed – can affect how it’s recycled, meaning it’s a more complicated process than glass recycling. Some ready meal trays can’t be recycled, as they can’t be identified by the optical sensors on the sorting machines. 5. What are the benefits of commercial plastic recycling? During the plastic recycling process, plastic is collected and then melted. After this, it’s usually turned into pellets that can then be used to make new plastic materials. Recycled plastic can be used in many ways. Indeed, it can be used in utility pipes for gas and water supplies, road infrastructure, and even petroleum. Not only will these actions help reduce the amount of commercial plastic waste you produce, but they can also be used as a way of branding your start-up. For more inspiration, read our article on plastic alternatives – a concept which made our best business ideas for 2019 list! From reading this article, you’ve learned more about business plastic disposal, including the different types of plastics and the processes necessary to dispose of them in the quickest, easiest and safest ways possible. We’ve also looked at what types of businesses plastic waste disposal could be most relevant for. Next, read our pages on waste disposal prices and the best waste management companies to learn more about commercial waste. Or, if you’re ready to compare quotes for commercial waste management now, simply scroll to the top of the page and complete the form.